The Centre for Process Innovation (CPI) is leading a specialist consortium creating a world class UK manufacturing supply chain that will enable the widespread adoption of packaging incorporating Near-field Communication (NFC) based technology. The three year project is titled ‘SCOPE’ and is building the manufacturing capability, capacity and skills required to commercialise and position the UK as a world leader in the production of smart products with printed sensors – a fast growing billion dollar global market. The Internet of Things describes a world in which everyday physical objects are able to communicate and exchange data with other connected devices through wireless technologies such as RFID and NFC. NFC is an emerging technology which constitutes an NFC chip, embedded or applied onto an object such as product packaging and then activated by interaction with an NFC reader or a Smartphone. Data can be gathered and transferred between the two devices when held in close proximity. 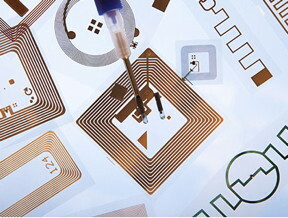 The production of NFC tags using printable electronics means in the future NFC tags will be able to be produced in a high volume, low cost manner with conformable geometries. Printed NFC will be able to be used for a host of applications such as providing product differentiation on fast moving consumer goods, tracking or indicating the authenticity of a product in logistics, anti- tampering controls which also provides data management information. However for the these products to reach the retailer, technology innovation is needed to develop the supply chain that facilitates the price points and market volumes industry needs for mass market adoption. The aim of SCOPE is to develop new processes, equipment and applications to enable the high-volume manufacturing (billions or even trillions) of printed electronic components that incorporate NFC. The project is providing a technology platform to develop new, innovative and novel functionalities and applications, alongside the building of specialist skills and capabilities. A key emphasis is to apply highly automated and high speed integration techniques to meet target costs of <1cent per NFC tag. The consortium comprises of 14 partners across the UK’s packaging supply chain including; world-class end-users in Unilever, Hasbro, Crown Packaging alongside Tier-1 product supply-chain companies Andrews & Wykeham and Mercian Labels. Additionally the consortium unites complementary technical expertise in the production of flexible integrated circuits (PragmatIC), the automation of processes (Optek), ferrite materials (University of Kent), electronics design (Silvaco), polymer substrates (Innovia), inks (Invotec and CPI), NFC know-how (NFS) and systems integration (CPI and PragmatIC). The British Print Industry Federation (BPIF) are supporting dissemination for the project, linking the supply chain together and providing end user feedback on the market readiness of the technology. The project covers multiple application sectors such as fast-moving consumer goods, beverage, games and security and provides a platform to develop second-generation opportunities within other key UK sectors including healthcare, food, energy, built-environment, defence and transport. Currently initial concepts are being developed around low-cost, high volume, printed logic for integration into labels for smart packaging and product branding on fast moving consumable goods. “The project brings together the whole innovation value chain, providing the platform for end-users to develop their next generation packaging concepts and to prove these in terms of market viability and appeal. So far, the consortium has made excellent progress and has worked closely to produce a range of NFC product concepts that integrate logic circuits produced on flexible substrates. Going forward the next steps are to upscale the manufacturing process to ensure that these novel NFC applications are produced at the cost and speeds that industry demands. To do this, we are currently developing the capability to scale up these production processes to produce market trial samples of up to 50,000-100,000 tags”. SCOPE is a £10 million collaborative project involving industry and co-funded by the Advanced Manufacturing Supply Chain Initiative (AMSCI). The Centre for Process Innovation is a UK-based technology innovation centre and part of the High Value Manufacturing Catapult. We use applied knowledge in science and engineering combined with state of the art development facilities to enable our clients to develop, prove, prototype and scale up the next generation of products and processes. Our open innovation model enables clients to develop products and prove processes with minimal risk. We provide assets and expertise so our customers can demonstrate the process before investing substantial amounts of money in capital equipment and training. New products and processes can be shown to be feasible; on paper, in the lab and in the plant before being manufactured at an industrial scale. AMSCI supported manufacturing supply chains in England to reshore in the UK and improve global competitiveness by encouraging innovative, collaborative projects which established strong, sustainable and balanced growth. Complementing the Regional Growth Fund, AMSCI offered flexible funding support for R&D, skills, training, capital finance and leveraging private sector investment.